Any graduate of Hunter’s Education knows the importance of a safe, comfortable lifeline system when hunting from a tree stand. That is why the professionals at Hunter Safety System have been working to bring hunters high-quality products for 17 years. “In the fall of 2000, John and Jerry Wydner were hunting white-tail deer along with their nephew Jerrod Karr in Eufaula, AL, when John’s tree stand collapsed beneath him. Because he wasn’t wearing the harness that was provided with his tree stand, he was headed straight to the ground. However, by the grace of God, he was able to catch hold of the top of the climber and shimmy down the tree. By the time he reached the ground, his clothing was torn, and he was bleeding and shaken. He immediately called for help. As soon as Jerry arrived, his first question was why John wasn’t wearing his harness to which John replied, ‘Were you wearing yours?’”- Read the full story here. Following that fateful hunt, John worked tirelessly with help from family and partners to create an adjustable safety harness system that was built into a vest and therefore easy to wear and manipulate. After much trial and error, Hunter Safety System was born. Since then, the company has expanded the line to include a variety of Hunter Safety products and accessories. Beginning in 2014, HSS struck up a partnership with UrgeMedia to get their products in front of outdoor television audiences across the United States. They have renewed this partnership for 2018. 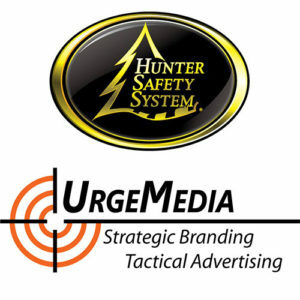 UrgeMedia based in Eagle, Colorado has been built on a passion for hunting and the outdoors. Their proprietary media acquisition structure gives outdoor brands big and small the opportunity to reach a large audience of likeminded customers. With inventory available in top shows on Outdoor Channel, Sportsman Channel, Pursuit Channel, and WILD TV as well as a cutting edge digital advertising platform, UrgeMedia provides impeccable service to brands in the outdoor space. Whether your marketing budget is $1,000 or $100,000, you can access an audience of passionate hunters and outdoor enthusiasts with help from UrgeMedia. Give them a call at 970.328.8001. This entry was posted in Our Brands, Partners. Bookmark the permalink.